Posted by sneaks in display topics, E, great ideas, J is for Juvenile, Picture Books, props and drapes, shelf tops. We just returned from a visit to the Pacific Northwest, and what trip to Seattle would be complete without a stop at the new, space-age, incredibly-well-funded central branch of the Seattle Public Library! The librarians there were very welcoming and fun to talk to (lots of tattoos). We took lots of pictures (camera was out of commission, so, sorry, they’re cellphone pictures) and snatched up most of their brochures and reading lists. Lots to share, so let’s get started. First up was this sweet and pretty display in the children’s area. 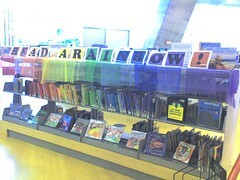 “Read a Rainbow!” was printed out on colored paper and inserted into acrylic stands. Small gauzy drapes (maybe they were cheap chiffon scarves) were hung along the top shelf edge, and the picture books below were arranged in rainbow color order. They had this right out front, and it really caught the eye. And there’s got to be some kind of transgressive thrill to arranging books in color order instead of by call # or alpha by author – for once! 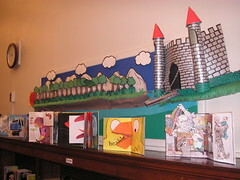 Posted by sneaks in display topics, E, great ideas, J is for Juvenile, J non-fiction, Picture Books, shelf tops. Spotted at the Hampden Branch of the Enoch Pratt Free Library – the good-looking alphabet books from Sleeping Bear Press displayed in alphabetical order. It was so satisfying to see them all lined up together: since they’re cataloged as non-fiction, they’re usually never in the same place at the same time. Search CARL on “Sleeping Bear Press” or see our list below. Posted by sneaks in great ideas, J is for Juvenile, pop-up books, shelf tops. It’s a dilemma – pop-up books are so appealing and cool, but so SO fragile! They beg to be touched, so we want to show them off, but too much love and they’re history. 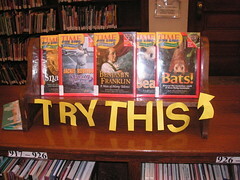 At this branch of the New York Public Library, the librarians display all the newest (i.e. least damaged) pop-up books on a shelf at (about) adult shoulder level, open to a eye-popping page. This way, there’s usually a grownup handing the book to the child. That means there’s at least a chance that the adult will teach or show the child how to get at all the pop-up fabulosity without ripping the thing to shreds. Besides, it’s not just kids who think pop-ups are cool. This placement subtly shows the adult that the public library is a great place to find the high-end stuff too! The three-D castle above ties in with the pop-ups really nicely, but not all of us have paper engineers on staff! Posted by sneaks in great ideas, shelf tops. Wow, what could be easier or more arresting? Seen at a New York Public Library branch – they cut letters out of construction paper and taped them to the bottom of a shelf-top fixture. The arrow really adds punch, don’t you think? Posted by sneaks in shelf tops, signage. 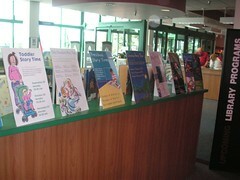 Cockeysville has gathered all of the easel-mounted posters for children’s programs in one place. They are lined up on top of a shelf that is showing its “back” to the larger space. This is a terrific use of this surface, especially given its proximity to checkout. Plus, don’t those posters all look great together? What a talented Art Department we have! Posted by sneaks in Picture Books, shelf tops. 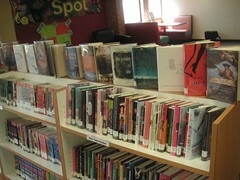 Another take on displaying books on a shelf-top, this one from Woodlawn. Books of the same height can make a sleek presentation when lined up with their spines slightly overlapping the previous book.